The last command adds the sbt executable into the PATH shell variable. Now we can call sbt from any directory to create and package our projects. The first time it runs it will need to fetch some data over the internet, so be patient! We are not quite done with the sbt yet. We need to install two very important plugins. 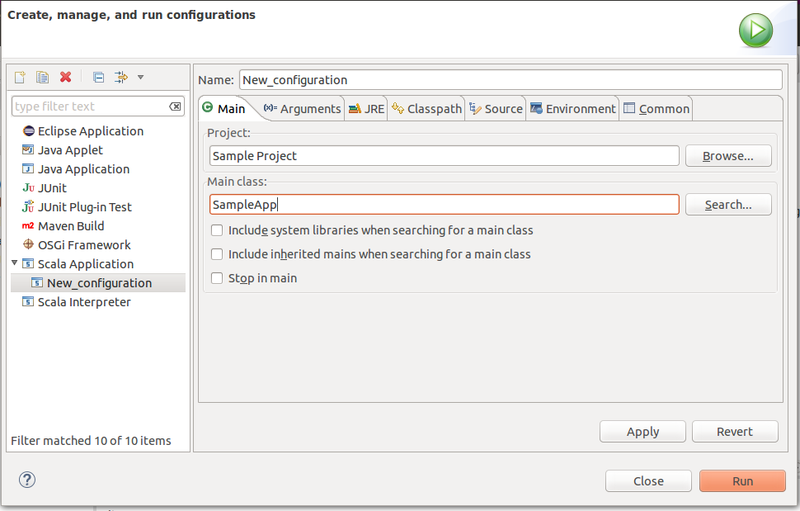 sbteclipse is the sbt plugin for creating Eclipse project definitions. After installation, the next time we launch sbt we will be able to use the additional command eclipse. sbt-assembly is an sbt plugin that creates a fat JAR of your project with all of its dependencies included. According to Spark documentation, if your code depends on other projects, you will need to package them alongside your application in order to distribute the code to a Spark cluster. This is why we need the sbt-assembly plugin. When creating assembly jars, list Spark and Hadoop as provided dependencies; these need not be bundled, since they are provided by the cluster manager at runtime. Once you have an assembled jar, you can call the bin/spark-submit script as shown later below while passing your jar. As with sbt above, we include the last command so as to make Spark binaries accessible from everywhere. Having installed all the necessary components, we now proceed to demonstrate the creation of a simple application. 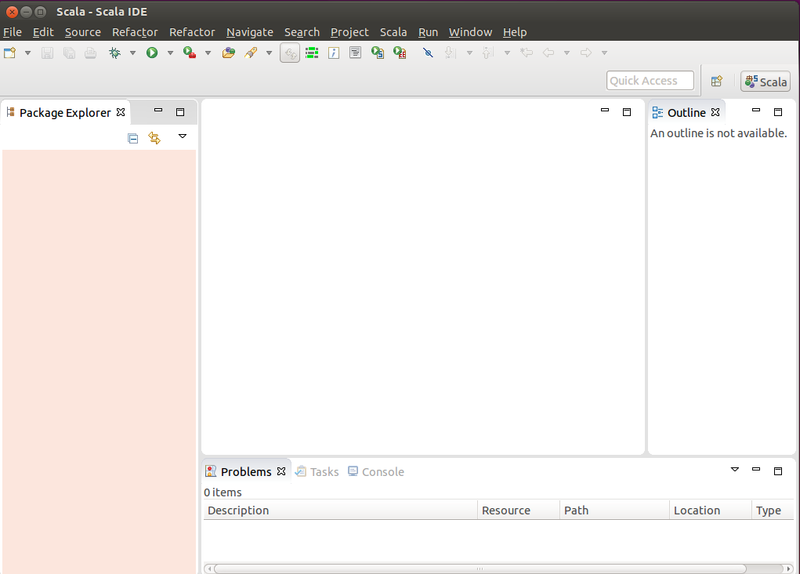 The task now is to create a self contained Scala/Spark application using sbt and the Eclipse IDE. libraryDependencies += "org.apache.spark" %% "spark-core" % "1.4.1"
We are now ready to package everything into a single jar and deploy using spark-submit. Notice that the sbt tool creates a hidden directory in the home folder ~/.ivy2/ that contains all cached jars used for packaging the application. We can easily verify that the number of lines in our simple script containing “val” are indeed six (five val assignments plus one occurrence in the println command argument). 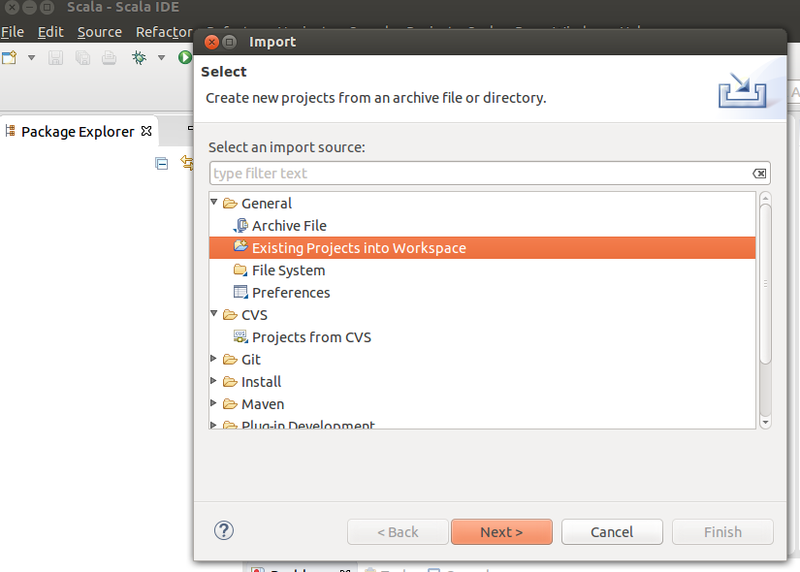 [info] About to create Eclipse project files for your project(s). Select Browse to seach for the ~/SampleApp directory. 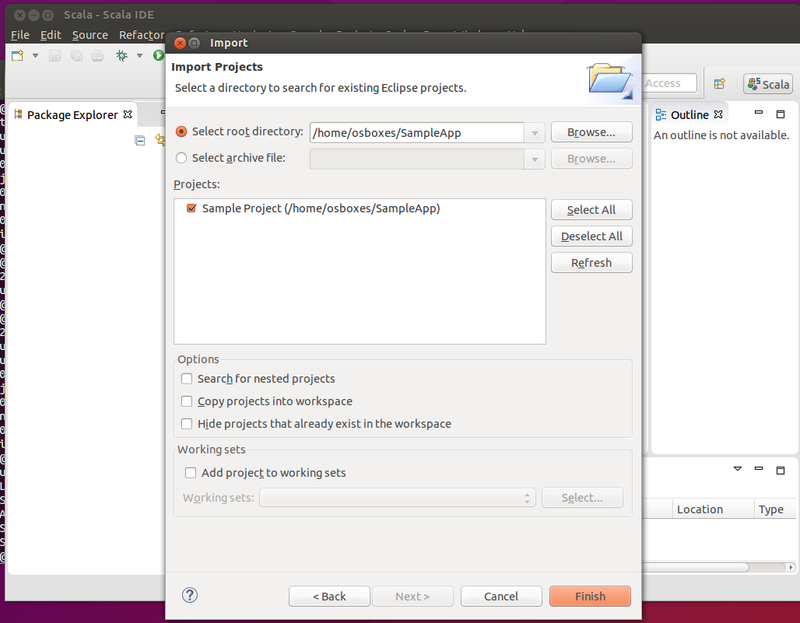 The result is the complete project tree in the Package Explorer of Eclipse. All Spark and Hadoop related dependencies have been automatically imported from sbt. 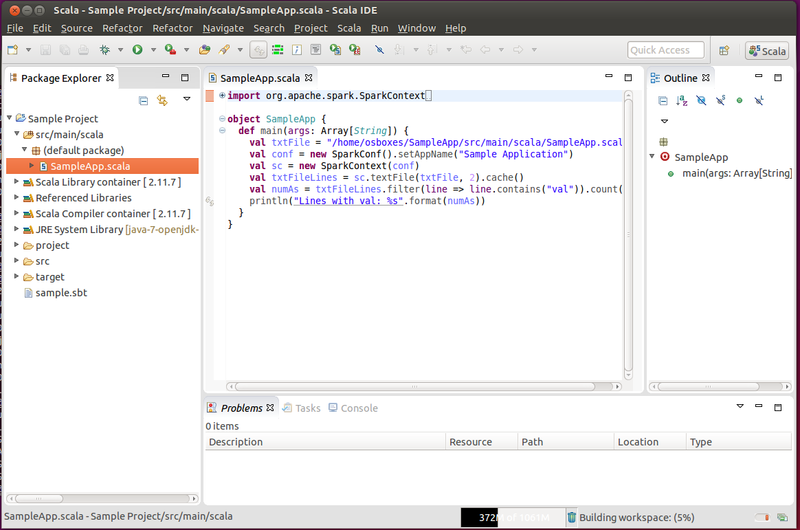 Now you can edit SampleApp.scala directly from Eclipse using code completion features, syntactic highlighters and more. Source code editing using Eclipse can be real fun! Code completion, refactoring, smart indenter, code formatting, syntax highlighting – you name it, Eclipse provides it! But what about running the application? We can do that too, with a little configuration and a minor addition in the Scala source code. Enter the name of the class we want to deploy – in this case it is SampleApp. Then press Apply and the run configuration is ready to go. 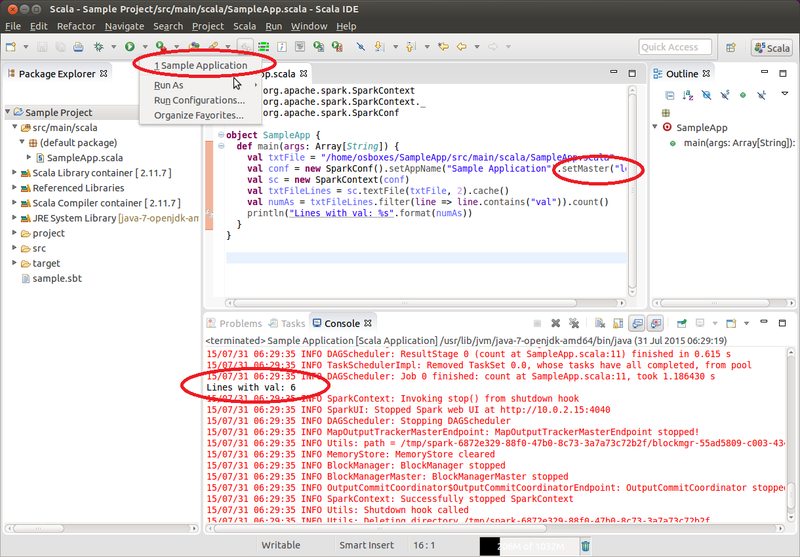 The last step is to modify the source code to reflect the Spark runtime configuration. In this example it suffices to set the master URL for launching to "local". This will run the application locally in a standalone mode. We have presented a walkthrough tutorial on how to seamlessly develop and deploy a simple Spark/Scala application using Eclipse and the sbt tool, including the installation and configuration of all software components needed. The tutorial was run on an Ubuntu 15.04 (x64) virtual machine. No assumptions were made for the required software other than Java SE Development Kit 7. In a follow-up post, we will present in similar detail the development and deployment of a more realistic application, demonstrating how to include dependencies on other Spark libraries (namely MLlib for machine learning), as well as dependencies on external Scala libraries. For simplicity, development and deployment were both launched in the same virtual machine. Deployment on a different cluster could possibly be the subject of a future post. Finally, we expect that the steps presented above will be useful also for developers wishing to use Java and Eclipse for developing Spark applications. This is also something that we may cover in detail in a future post. Constantinos Voglis is one of our resident Data Scientists. He holds a PhD in numerical optimization methods and he has numerous academic publications in the field, including its applications in machine learning and graph processing. He is currently working on machine learning algorithms that originate from big data analysis tasks. Thanks a lot. Great job. EXACTLY the tutorial I’ve been looking for… Way to go Constantinos, thank you! How to load a file from a local file system without using hdfs? Could you elaberate on setting the configuration files and setting the env variables? Thank you very much. I am really glad that you find this post useful. Regarding sc.textFile() you can append the “file://” in the beginning of the file location string “file:///home/osboxes/SampleApp/src/main/scala/SampleApp.scala”. This will instruct Spark to load the file from the local file system. For the configuration files and environment variables I use the default settings that come with the installation of Spark 1.4.1. I believe that earlier versions of Spark search in the “hdfs://” domain by default and need “file://” preamble to locate files in the local system. First, thanks a lot for this great post. Thank you very much Sergio! One logical explanation would be if you missed (or misspelled) the proper path hierarchy. I will try to reproduce this situation. I managed to reproduce and find the issue: There’s a typo in line 8 of your sample code. You wrote “object SimpleApp”, it should be “object SampleApp”, instead. Once fixed, it works. Thank you very much for your correction. Indeed the correct object name is “SampleApp”. cleared this once and for all! It seems you read my mind. I was looking exactly for the same stuff. Thanks. hey guys i m stuck at the point where “sbt package” command doesnt work for me..
can anyone pls help me resolve this issue and guide me to complete the setup. Probably you missed the step that adds sbt to the execution path. You can find these instructions in the beginning of the post in the “Installing sbt” section. Thank you so much! I’ve been struggling with this for hours.